Spanish luxury winemaker Barbadillo has added promotional neck collars equipped with NFC tags to 126,000 bottles of its best-selling Castillo de San Diego white wine for a nationwide campaign that gives customers the chance to win a €1,000 (US$1,172) prize. The campaign is believed to be the world’s largest deployment of NFC within the wine and spirits industry to date. 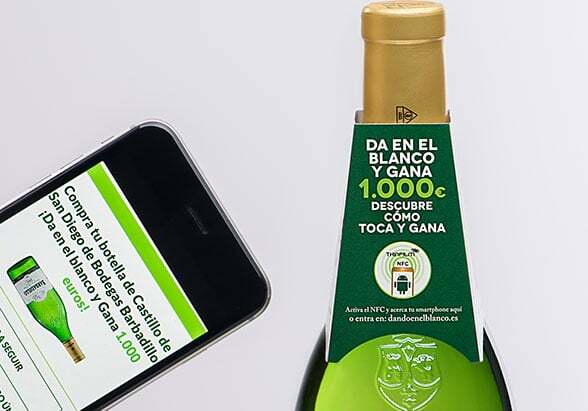 “Through a customised NFC-enabled neck collar, consumers are instructed to tap bottles of Castillo de San Diego with their smartphone to learn more about the promotion, which offers the chance to win 12 distinct €1,000 prizes,” says NFC tag specialist Thinfilm, which provided the technology used by Barbadillo for the Dando en el Blanco (‘Hitting the Target’) campaign. “Upon purchasing and opening a bottle, customers can retrieve a unique code printed on the cork and enter it in the field displayed on their smartphone — along with their name and other personal information — to instantly determine if they are a winner. Barbadillo integrated NFC tags into its limited edition bottles of Versos 1891 rare sherry so customers could check the beverage’s authenticity with a tap of their mobile device in March last year. “The Dando en el Blanco campaign featuring Castillo de San Diego illustrates a compelling use case for NFC mobile marketing — not just in the wine and spirits industry but with other consumer products as well,” adds Davor Sutija, Thinfilm’s CEO.